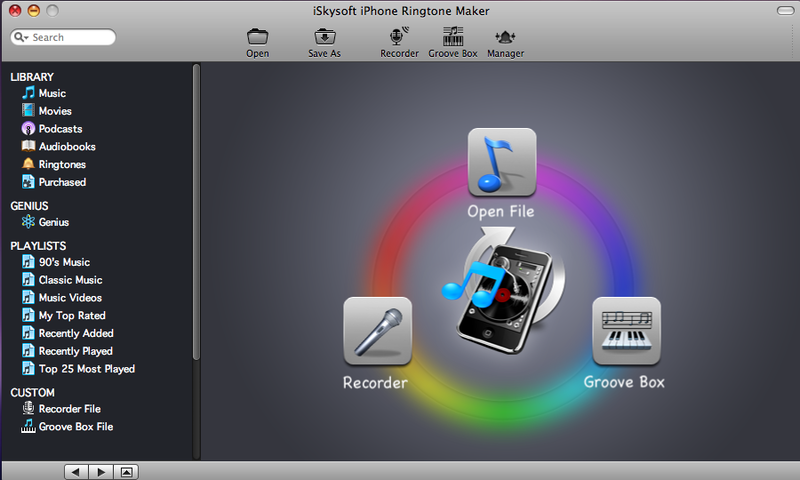 iSkysoft iPhone Ringtone Maker on Mac is a iPhone Ringtone(M4R) converter designed for Mac OS users to convert their audio or video files to iPhone Ringtone.With this iPhone Ringtone,you can not only convert various audio and video formats files, but also allows users make and manage characteristics and distinctive iPhone ringtones with the added Recorder, Groove Box, Ringtone Manager, Transfer to iPhone Straightly etc. functions. Convert almost all audio and video formats to M4R ringtone formats on Mac. iPhone Ringtone Maker support various popular formats such as MP3, WAV, WMA, M4A, AC3, etc. and video formats MTS, TS, M2TS, MOD, TOD, WMV, MKV, etc. Choose music or video direclty from iTunes library on the left side of the main interface or you can drag other music or video files directly to the program. Audio waveform of the selected items can be shown on the program. Zoom function can let you enlarge the waveform for more precise trim for complicated music. Drag and drop the slide bar to appoint the start point and end point for your iPhone ringtone length. Alternatively, you can type exact time value into time-setting box. the best assistant to make ringtone for your iPhone, iPhone 3G by yourself. Create and upload ringtones to cell & mobile device with AVS Ringtone Maker! pdc Form Maker is the program designed to create the paperless office. It builds audio cutter and ringtone converter in one software. Copy DVD on Mac OS X with the original quality . Audio cutter and mp3 ringtone converter. Qweas is providing links to iSkysoft iPhone Ringtone Maker for Mac 1.6.0.1 as a courtesy, and makes no representations regarding iSkysoft iPhone Ringtone Maker for Mac or any other applications or any information related thereto. Any questions, complaints or claims regarding this application iSkysoft iPhone Ringtone Maker for Mac 1.6.0.1 must be directed to the appropriate software vendor. You may click the publisher link of iSkysoft iPhone Ringtone Maker for Mac on the top of this page to get more details about the vendor.